Fighting Dreamers Production (FDP) is a cosplay group from Vancouver, British Columbia. For the past 10 years they have been cosplaying a wide range of genres including anime, manga, video games, comics, film, and cartoons. Fighting Dreamers Productions are known for their cosplay YouTube channel, which has over 180,000 subscribers and provides viewers with series shows, parodies, cosplay skits, CMV's, convention happenings, and tutorials. FDP is a non-profit group and has organized a number of charity events through their cosplay work such as "Pray for Japan" helping earthquake and tsunami victims, "Aang for a Cure" which benefited cancer patients and a charity print drive to support relief efforts for victims of Hurricane Harvey. 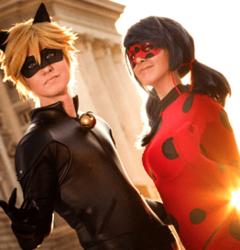 As cosplayers, FDP emphasizes inclusivity and promotes accessibility of cosplay through panels and performances at conventions across North America, the UK, Ireland, Europe, Scandinavia and Australia.